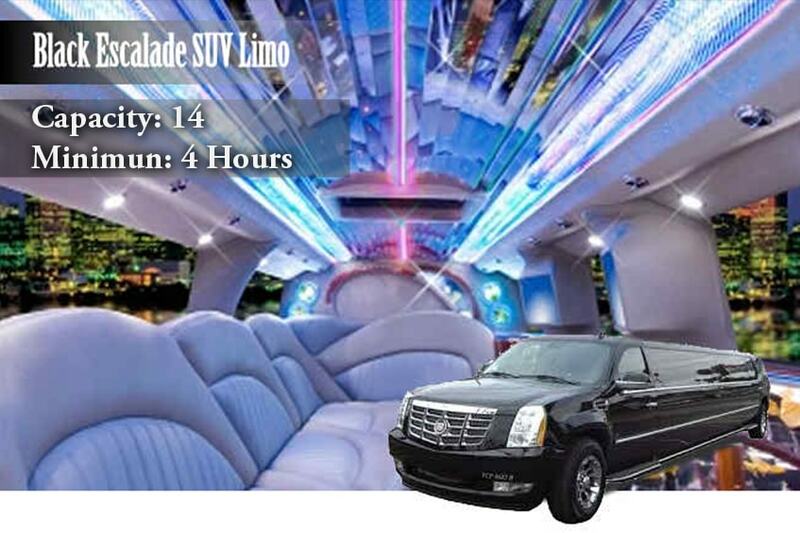 Our Escalade SUV has been remodeled to fit the ever-changing taste of style and luxury of our clients. Our sleek vehicle is now fitted with white leather seats with one-way mirrors for great sightseeing and complete privacy. At night, you can turn on the opera lights for a more festive atmosphere. Request for food and drinks for a great party. Suv’s limo New York can be used for prom, weddings, sports events, city tours, or airport transfers to Disney resorts or Port Canaveral cruise ships. It is large enough to accommodate up to 14 passengers excluding the chauffeur so it’s definitely fun, fun, fun when you’re in here. We can pick you up and drop you off at any point in New York. Our service is good for a minimum of 4 hours. If you wish to extend, simply let us know beforehand, and we’ll be more than happy to honor such request.